There are some amazing dining experiences within Walt Disney World that change from visit to visit. They can be a confusing lot to uncover as some are Signature Dining locations and some are not, but not all of the Signature Dining locations fit into the category. What category, you might ask? A restaurant that changes its dishes based up the availability of fresh products and the chef’s brainstorms. There are certain staples that will be found on these menus, of course, but that doesn’t mean you’ll see the same bill-of-fare each time you visit. Constant change can be delicious, but it can also make a venue extremely hard to review and predict. However, we’re going to give one of these restaurants our best shot and give you an idea of what to expect. Today, we step back into the Hollywood of old for a meal at The Brown Derby of Disney’s Hollywood Studios. There are things you will notice about The Brown Derby immediately; the gleam of polished metal, the deep, rich browns of the wood, the staggered levels of the dining room, and the caricatures of famous celebrities lining the walls. The ambiance here feels as if you have ventured back to the golden age of Hollywood, it is the Hollywood Tower Hotel without the dust and cobwebs, or the ghosts. I opted out of an appetizer for a flight of wine, but I believe either option would have been delicious! There are usually about eight to ten entrees on the menu, but I was advised to order the chop. 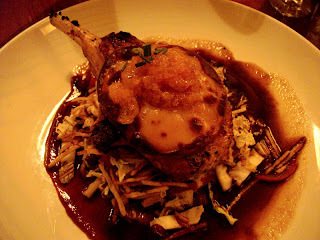 On the day I visited that took the form of a Sterling Silver Pork Chop topped with Smoked Gouda and Apricot preserve served over Napa Cabbage, Bacon, and Potato Hash with Apple Cider Jus. The advice was some of the best I’ve had, and so I’ll pass it on to you, order the chop. I’m sure the filet, chicken, fresh catch or any of the other options would be just as tempting and delectable, but this was one of the most succulent, savory-tangy dishes I’ve ever had the pleasure to enjoy! For dessert, I went after the Brown Derby original, the Grapefruit Cake. This yellow cake with cream cheese icing has been on my Disney dessert bucket list for some time, and it did not disappoint. Creamy, sweet, with just a twinge of sour, this cake really cleansed the pallet and hit the spot. 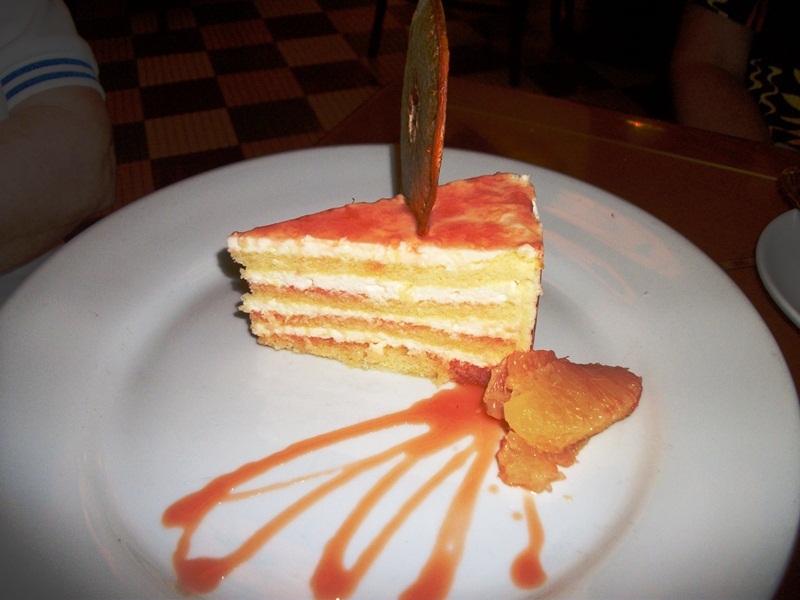 If I had one complaint the thin layers of cake did seem a bit soggy. Overall, I don’t believe there is a bad meal to be had at The Brown Derby! I want to discuss a pet peeve of mine for a moment. 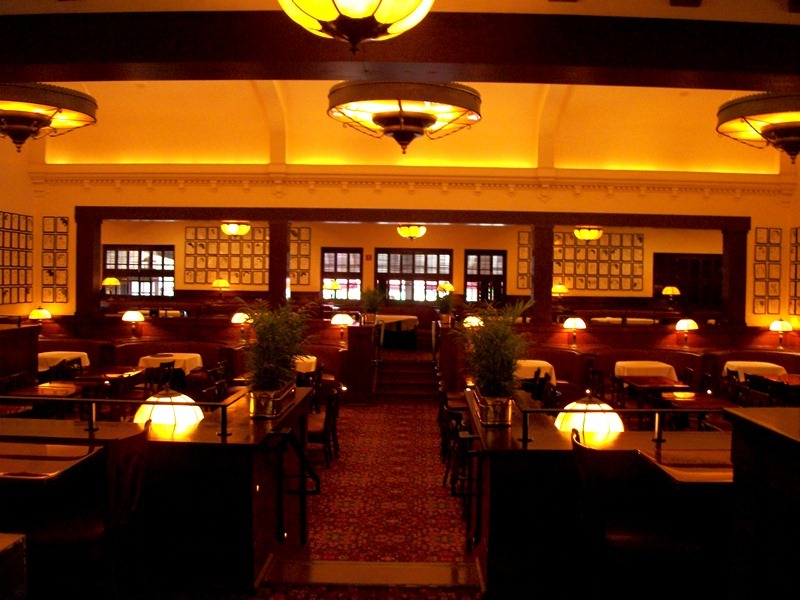 As you can tell from above, The Brown Derby is a bit of sophistication in an otherwise relaxed setting. Now I’ve made my pleas about dressing up, not down for the parks in the past, and I understand I am in the minority there, but this is different. This is a dining experience, not a meal. Think of a nice steakhouse in your town compared to, say, an Olive Garden. There is nothing wrong with either destination, but you wouldn’t wear a t-shirt and flip flops into the steakhouse, although you might at Olive Garden. The Brown Derby deserves the same respect as the steakhouse, especially at dinner time. Make this an event for your significant other or family, leave the parks, get gussied up, and come back ready to step into glitz and glamour. 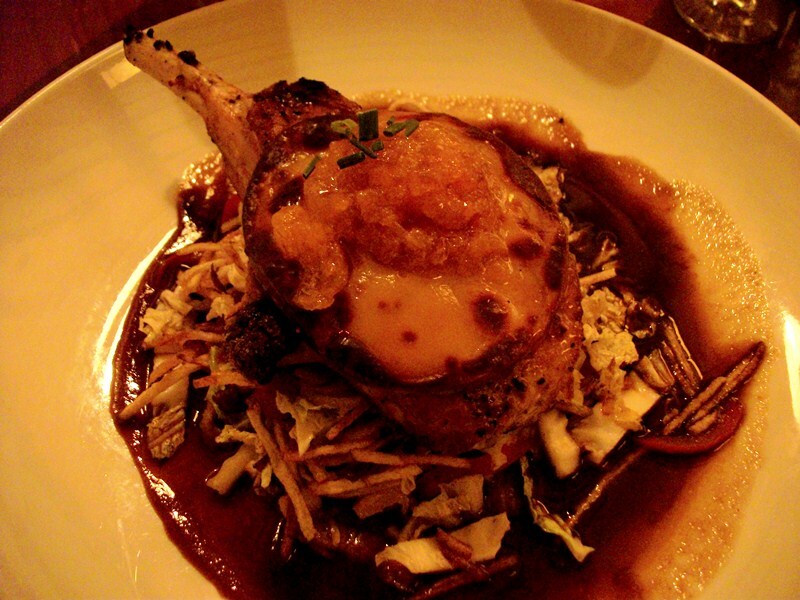 The Brown Derby offers an amazing meal with top tier ambiance. You could be there on any random day of the year, no birthday or anniversary, but you certainly feel as if are celebrating something special in this restaurant. Settle in for a long meal with some good friends and good conversation, and you are sure to feel as if you are one of Hollywood’s leading men or most sought after starlets. I've found the food to be top notch and service always grand. The Brown Derby was our pick for Thanksgiving Day dinner on our only holiday time trip to Disney. I will always have those memories of the special dinner we enjoyed there. I had a great champagne cocktail called a pointsettia! The ambience and menu only added to the festive occasion.